Week 2 was a monster passing week! Let's take a look at this past week's studs and duds. If you didn't have a big day from your fantasy QB in Week 2, you probably were not a winner. Patrick Mahomes and Ryan Fitzpatrick led the way for the second straight week. 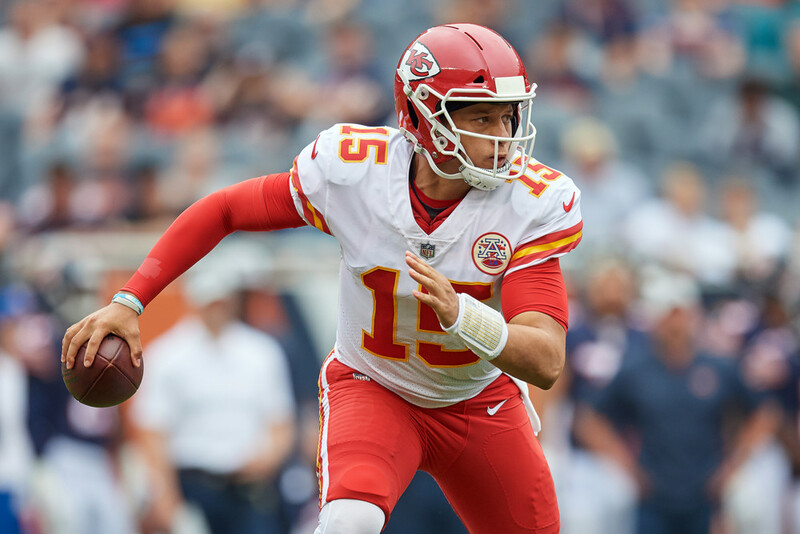 Mahomes had an incredible 6 TD passes and now has, an NFL record, 10 touchdowns in two weeks. Fitzpatrick had 400+ yards and 4 TD passes for the second straight week. Those two Patricks just had the best two-week starts for a fantasy QB in NFL history. Ben Roethlisberger, Blake Bortles, and Kirk Cousins also went over 400 yards of production with 4 TDs each, and Matt Ryan used 2 rushing TDs to hit 4 TDs on the day. With so many huge passing days, there weren't many duds. Alex Smith stood out as Washington couldn't find the end zone at home against the paltry Colts. Smith had 292 yards on 46 attempts. At least he was better than Sam Bradford, who led an anemic Cardinals offense to just 90 yards passing. He may not be long for his role. With so many big passing games, the RB scene was pretty pitiful. Todd Gurley and Melvin Gordon saved the day for fantasy owners with 3 TDs each, despite neither of them hitting even 75 combined yards. Christian McCaffrey was a PPR monster with 14 catches for 102 yards. Matt Breida was the day's top rusher with 138 yards and a TD and is a must-own for the 49ers. So is Denver's Philip Lindsay, who became the first undrafted rookie ever to hit 100 combined yards in each of his first two games. David Johnson disappointed again. The Cardinals had only three first downs until their final drive and failed to score a point, and Johnson had just 51 combined yards and only one catch. Adrian Peterson failed to follow up his big Week 1, recording only 20 yards on 11 carries. The Bucs may be 2-0, but Peyton Barber sure isn't doing much. He had just 16 carries for just 22 yards. It might be time to give Ronald Jones another try. Rex Burkhead was a favorite fantasy sleeper for many but saw just 6 touches for 22 yards and wasn't involved in the passing game. Michael Thomas leads this section for a second straight week. He had a pair of TDs with 89 yards and 12 more catches, and he set an NFL record with 28 catches the first two weeks. JuJu Smith-Schuster had a huge day with 13 catches for 121 yards and a TD, and Jacksonville's Keelan Cole had 116 yards and a TD along with the catch of the season thus far. Both Vikings receivers showed up. Adam Thielen had 12 catches for 131 yards and a score, but he was out-pointed by Stefon Diggs with 9 receptions for 128 yards, two TDs, and a two-point conversion. And don't forget Thursday night! A.J. Green started Week 2 off with a bang with 3 TDs Thursday, all in the first quarter. Another Cardinal makes the list, as Larry Fitzgerald was silent. He had only 3 catches for 28 yards and missed a chunk of time with a hamstring injury. Denver's Demaryius Thomas was also a dud with 5 catches for only 18 yards. Week 2 was a near opposite of Week 1 for tight ends as almost everyone that disappeared last week showed up big. Travis Kelce led the way with 7 catches for 109 yards and a pair of TDs. Zach Ertz and Jimmy Graham had 11 and 6 catches and came just a few yards short of triple digits. The streamer of the week was Pittsburgh's Jesse James, who tallied 138 yards and a TD. Week 1's big performers Rob Gronkowski and George Kittle were duds in Week 2. Gronk had just 2 catches for 15 yards as the Jaguars shut him down. Kittle had only two catches and was outdone by teammate Garrett Celek, who found the end zone. Hot free agent pickup Jonnu Smith didn't have a catch or even a target for the Titans.